It was the dawn of the 20th century. Despite a strong undercurrent of political and social unrest, it was a calm, confident, strong America that proudly stepped forward into a new age, ready for whatever might come, under the leadership of a softly-walking, stick-carrying President named Theodore Roosevelt. May 22, 1997. Shore Line Trolley Museum Car 1414 poses at Lake Compounce Park. The trolley car, which had debuted in Richmond, Virginia in 1888, was now a dominant force in the lives of everyday Americans. Providing quick, affordable transportation, the trolley car, along with its heavier brethren rail services, opened up a vast new horizon that would become known as "the suburbs". Ripe with the rewards of American economic prosperity, a new, "middle" class was emerging, by day working in the city, and keeping a home many miles away in what used to be called "the countryside". Their daily ebb and flow lead to the coinage of a new term: "commuter". During their days off, the newly prosperous middle class were in search of ways to spend their leisure dollar. The amusement park was king. For just a few pennies, one could enjoy a day of cotton candy and carrousel rides. Here again, it was affordable public transportation that made it possible. Just about every amusement park could be reached by trolley, and in fact many were owned by trolley car companies. Ridership to and from the parks accounted for a good share of summertime revenue. Opened in 1846 near Bristol, CT, Lake Compounce was the country's first amusement park, and offered swimming, rowing, picnic tables, a gazebo and even a bowling alley. It was 50 years before the first permanent structure, a restaurant and casino, was erected on the site in 1895, the same year that trolley service to the park began. As the trolley car brought more and more visitors to the park, the park grew and attracted even more ridership. Soon, there were two trolley car companies offering service to Lake Compounce: the Bristol Traction Company and the Connecticut Company. In 1911, a brand new carrousel was opened at Compounce, and in that same year, the Osgood-Bradley company of Worcester, MA delivered car number 1414 to the Connecticut Company's fleet. Part of an order of over 100 similar cars, 1414 is a 15 bench open car that seats 75 persons. Its open sides and end platforms provided what had to pass for air conditioning on those hot and humid summer days. Of course, in the colder months, the cars sat idle and did not earn their keep. For this reason, open cars were not popular with the management of most trolley car operating companies, and many considered the Connecticut Company's 1910-1911 purchase of open cars to be pure folly. Nonetheless, good use was gotten out of the cars even in the bitter cold of late fall, as they were trotted out to handle the large crowds at the Yale Bowl in New Haven. As a result, several examples of cars such as 1414 survived into 1947, and it and 3 others were preserved by our museum. When the Kennywood Entertainment Co., West Mifflin PA, announced in 1996 that it would begin a $35 million revitalization of the Lake Compounce park, it approached the Shoreline Trolley Museum with an unusual quest: to restore trolley service, which had been absent since 1935, to the park. Rather than using a replica, Kennywood desired an authentic vintage trolley car for this purpose, and was particularly delighted when offered an example of a car that actually ran to Compounce. 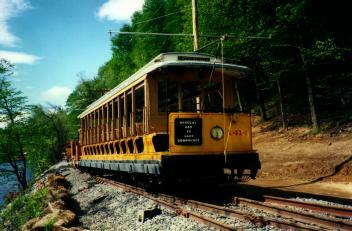 The museum agreed to lease car 1414 to Lake Compounce for their 1997 season. Kennywood constructed a new 1800 foot scenic trolley line alongside the lake, complete with a trolley station building, a maintenance pit, and the requisite overhead wire and power supply. On May 21, 1997, several of the Shoreline Trolley Museum's members assisted in loading the 41,500 pound vehicle onto a flatbed truck, whereupon it was taken to Lake Compounce and carefully unloaded onto its new home track. When power was turned on June 8, the car was successfully test run. Car 1414 will serve to shuttle visitors between the main park complex and another area within the park where visitors can take a ride on a raft, a chair lift, or enjoy a picnic lunch. The park will be open from June 27 through September 21. For more information, contact Lake Compounce at (860) 583-3631. October 18, 1997: Lake Compounce's first season was a huge success, and the museum's trolley car was a popular attraction. It made 6220 trips totaling 2200 miles, and carried 275,535 passengers. That's comparable to the kind of action the car saw during its days with The Connecticut Company in passenger service, and is a modern-day testimonial to the ease with which the open car design allows passenger loading and unloading. With both parties pleased with the first season, the museum and Lake Compounce look forward to continuing their arrangement in the coming years.